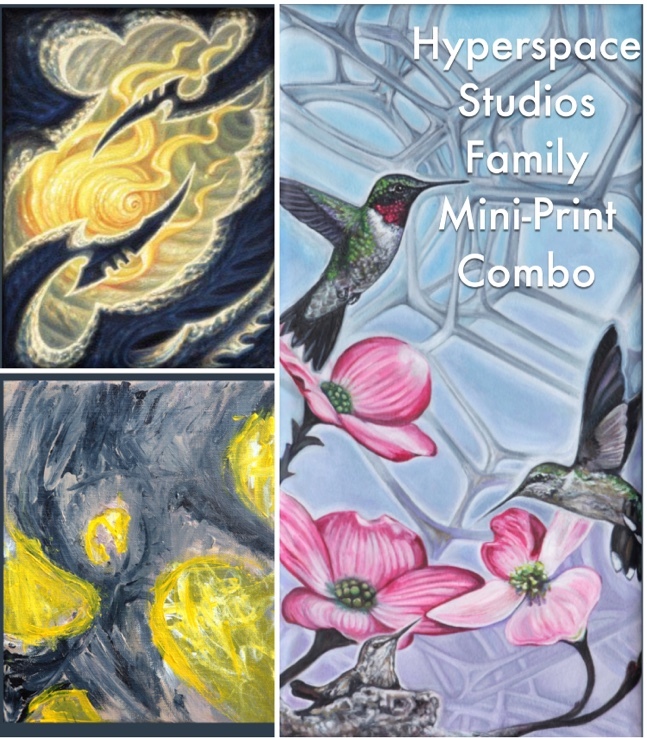 Celebrate the holidays with the Hyperspace Studios Family Mini Print Combo! We are bundling together three small prints from @guyaitchisonart @michelewortman and their daughter Kaia Rose. Guy's painting Flamecoil is about focusing personal internal energy, making it a perfect gift for artists. Michele's painting Trio celebrates family, in a palette meant to work well in any architectural space. Kaia's painting Wooden Duck is an abstract exploration of light and form. The prints are 8x16", 8x11" and 8x10" plus 1" colored borders for mounting purposes, and are signed by the artists on archival canvas, $100 for all three. We've added this combo permanently to our catalog, but for the next two days it's our featured item, giving you free US shipping on it plus anything else you order along with it! (FREE SHIPPING to US orders only. Shipping to Canada is $22.00 and anywhere else is $32.00.